Discussion in 'Brand Specific Section' started by 67L36Driver, Oct 14, 2016. Look on the points box cover. Sometimes it’s imprinted on them. And, even have a tab to use as a feeler gauge. Thanks Carl. It is there. 0.020". Appreciate the reply. 67L36Driver and msellers like this. msellers and fossil like this. I bought a Super 990 and the chain came with it. Found the bolt size for the rear handle lower holes and feeling pretty stupid I asked. Most common size used on Remington and Homelite back then is #12-24. I have a Helicoil repair kit for that size. Left over from when I ran Holly carb on my vet. Leaky float bowel screws. fossil and msellers like this. Some of the screws didn't give sizes but the one I was looking for did on the IPL . The 990 seems to be mostly 1/4-20 with a few number 12's and at least one 1/4-28 nut. The crank nut is a fine 7/16 thread. Almost back together now. I picked up a couple of 1/4-20 square nuts tonight for the rear handle upper bolts and then add the front handlebar and clutch. I hope to hell it runs. 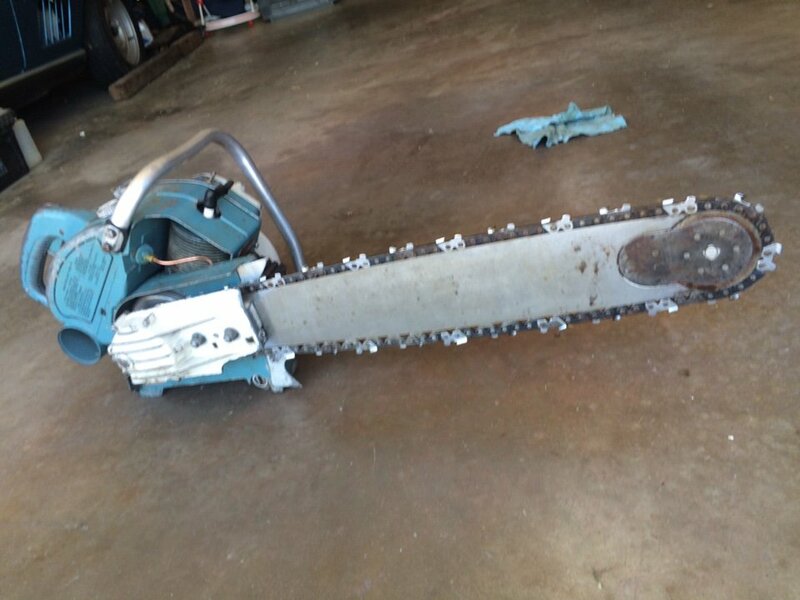 I must have 20 hours in cleaning as the saw cake had dried out and was tough to get off. The tanks were clean. Bit of a pain to assemble it all. I did manage to cross the FW side seal with an exact replacement SKF seal. Kind of an oddball seal. Super 990 finally together and ready for a test start. I think it runs pretty well so far. I need to get it in a bit of wood.